2018 turned out to be the most lucrative year ever for Proposition 65 attorneys and their clients, according to settlement data collected by the California Office of Attorney General (OAG). The famous “right-to-know” law has been on the books for more than 30 years, and requires businesses to provide warnings for exposures to any one of the more than 900 chemicals on the Proposition 65 list that are known to cause cancer, reproductive harm or birth defects – or face hefty civil penalty and attorneys’ fees demands from the OAG, a district attorney or, far more commonly, private enforcers who initiate their claims by sending Notices of Violation. Reviewing the recent trends, the indications are that the private enforcer claimants are becoming more efficient at extracting as much as possible from the unfortunate businesses who receive Notices of Violation. Even though California’s Office of Environmental Health Hazard Assessment (OEHHA) is supposed to benefit from Proposition 65 recoveries, the chart below shows graphically that the vast majority of the money obtained by the claimants stays with the claimants – and most of it stays with the claimants’ attorneys. 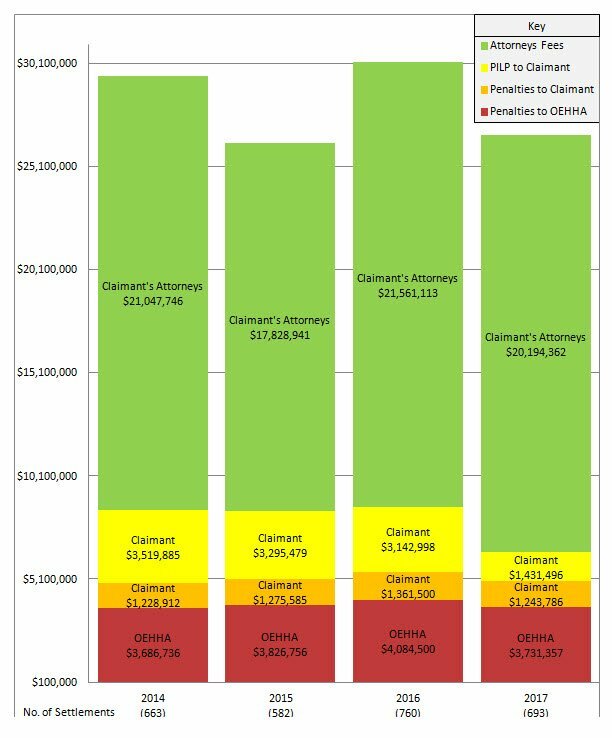 In 2018, less than 12% of the money obtained by private enforcers went to OEHHA, and more than 79% went to the claimants’ attorneys. The claimants’ increasing efficiency is shown clearly by the fact that, even though the number of Notices of Violation sent to businesses dropped by approximately 13% (2,710 in 2017 and just 2,364 in 2018), the number of settlements and judgments increased from 693 in 2017 to 834 in 2018. The average settlement shot up by 13%, from $38,395 in 2017 to $44,097 in 2018. This was buoyed in large part by a huge increase in the attorneys’ fees and costs collected by plaintiffs’ attorneys. In 2017, plaintiffs’ attorneys took in $20.2 million in attorneys’ fees and costs. 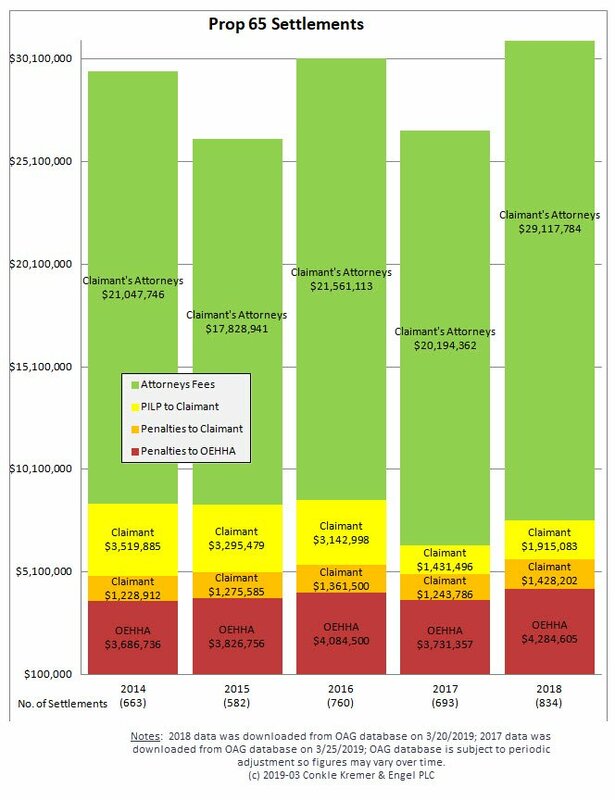 In 2018, plaintiffs’ attorneys recovered $29.1 million in attorneys’ fees and costs. The small circle of private enforcers making these claims remains an exclusive club. The claimants active in 2018 included: Alicia Chin; Amy Chamberlin; Anthony E. Held, Ph.D., P.E. ; Anthony Ferreiro; APS&EE, LLC; As You Sow; CA Citizen Protection Group, LLC; Center for Advanced Public Awareness, Inc.; Center for Environmental Health; Consumer Advocacy Group, Inc.; Dennis Johnson; Donny Macias; Ecological Alliance, LLC; Ecological Rights Foundation; Ema Bell; Environmental Law Foundation; Environmental Research Center, Inc.; EnviroProtect, LLC; Erika McCartney; Evelyn Wimberley; Gabriel Espinosa; Hector Velarde; John Moore; Estate of Karen Charlene Calacin; Kim Embry; Kingpun Cheng; Laurence Vinocur; Maureen Parker; Michael DiPirro; Paul Wozniak; Peter Englander; Precila Balabbo; Russell Brimer; Safe Products for Californians, LLC; Sara Hammond; Shefa LMV Inc.; Susan Davia; The Chemical Toxin Working Group, Inc.; and Whitney R. Leeman, Ph.D. Questions still remain as to the effects on the Proposition 65 industry of the OAG’s amended settlement guidelines that went into effect October 1, 2016, and the new clear and reasonable warning requirements that went into effect August 30, 2018. We posited some theories in our previous blog post on the issue, but it’s too early to tell the collective effects of these changes on the net Proposition 65 costs for businesses. One thing is for certain: The risks to businesses are increasing as Proposition 65 claimants are demanding more money than ever to resolve their claims. Absent any meaningful Proposition 65 reform, that trend will only continue. Unfortunately, Proposition 65 is notoriously difficult to reform because it requires a two-thirds majority approval of each house in the Legislature and any amendment must further the purposes of Proposition 65. The best approach for businesses is to be proactive to try to meet the Proposition 65 challenges before they become very costly burdens. Aside from carefully reviewing your compliance, the most important factor in reducing costs of resolution is to act promptly when you receive a Notice of Violation to contact qualified counsel experienced in Proposition 65 issues. Conkle, Kremer & Engel keeps up to date on developments in Proposition 65 and provides expert guidance to clients to ensure compliance with Proposition 65 and other regulations. This blog post was coauthored by Desiree Ho. We previously blogged about Proposition 65 trends based on data about settlements and judgments collected and made public by the California Attorney General’s Office. One trend we noted was the downward shift in civil penalty offsets known as “payments in lieu of penalties” (PILPs) or “additional settlement payments” (ASPs), due to recent amendments to the Proposition 65 regulations to rein in such payments. We’ll refer to these offsets collectively as ASPs and look at how the amendments have affected the Proposition 65 “industry”. By way of background, Proposition 65 generally allows claimants (termed private enforcers) to keep 25% of the civil penalties as well as recover their attorneys’ fees and costs in enforcement actions. The state’s regulating agency, the Office of Environmental Health Hazard Assessment (OEHHA) retains the other 75% of the civil penalties. While Proposition 65 authorizes penalties of up to $2,500 “per day for each violation,” the reality is that civil penalties make up a very small portion of an overall settlement or judgment: The vast majority of the payment is earmarked as attorneys’ fees and costs paid to the claimant’s lawyers. In the past, Proposition 65 private enforcers have often demanded additional payments that were treated as offsets to civil penalties. In other words, whatever the appropriate amount of civil penalties, they would carve out a portion of it as ASPs, because the claimants could keep the ASP portion entirely or direct it to a related entity – in addition to retaining their 25% share of the civil penalties. OEHHA does not receive any part of an ASP. The regulations as amended also reflect the Attorney General’s position that ASPs should not be included in any settlement that is not subject to judicial approval and ongoing judicial oversight. The effect has been that, since 2017, only one private settlement agreement has included ASPs. Several others were reported in 2017 and 2019, but a review of the settlement agreements showed that the private enforcer in those cases erroneously reported its 25% portion of the civil penalties as ASPs. While this can be seen as a bright spot, it may have the unintended consequence of lowering the incentive for certain private enforcers to settle early and privately, increasing costs to businesses who receive a Proposition 65 “notice of violation” – the official precursor to legal action. Indeed, since the amendments, we have continued to see a high number of court judgments contain ASP provisions, since those are still allowed under the amended regulations but subject to additional scrutiny by the Attorney General. In 2017, 90 of the 345 court judgments called for payment of ASPs (totaling $1,421,660) and in 2018, 109 of the 366 court judgments included ASPs (totaling $1,915,083). While not all plaintiffs are as aggressive about collecting ASPs, some NGO plaintiffs (such as As You Sow, Center for Advanced Public Awareness, Center for Environmental Health, Consumer Advocacy Group, Ecological Rights Foundation and Environmental Research Center) still show a strong preference for ASPs in resolving their claims. It is possible that OEHHA’s move to restrict ASPs results in more lawsuits and fewer pre-litigation settlements, but may not ultimately reduce ASPs as much as anticipated. More problematically, the amendments seem to have had the unintended effect of driving up the civil penalties and attorneys’ fees and costs. The amended regulations provide that ASPs should not exceed the 75% share of the civil penalty paid to OEHHA. Previously, ASPs in both private settlements and judgments often exceeded the total civil penalties. The regulations now effectively place a cap on the amount of ASPs: ASPs that exceed 75% of the civil penalties may cause the Attorney General to file an opposition. So to maximize their own recovery private enforcers are now settling for what seems to be high civil penalties and ASPs that are a hair below 75% of that amount. Legally, that is a very doubtful practice – since ASPs are an offset to civil penalties, a defendant should pay the same total amount based on statutory factors, regardless of whether any part of the payment is earmarked as an ASP or if all of it is treated as a civil penalty. One of the most stunning observations of the trends in Proposition 65 recoveries is that the attorneys’ fee portion of Proposition 65 settlements has increased every year. As we will discuss further in a later blog post, in 2018 the total amount of attorneys’ fees and costs collected by Proposition 65 plaintiffs shattered all records. Attorneys’ fees made up 79% of all Proposition 65 recoveries in 2018 – up from 76% in 2017. The claimants’ attorneys collected an astonishing $29,117,784 – an increase of nearly $9 million over 2017. It is not a big leap to infer that there is a connection between this and the changed regulations reducing claimants’ ability to rely on ASPs – claimants may be increasing the attorneys’ fees portion of their recovery to make up for perceived “losses” in ASPs. What do the amended regulations and the settlement trends mean for businesses defending against Proposition 65 claims? For one, settling early and privately in an out-of-court settlement is a recommended strategy. ASPs should not be part of such early agreements. This means anyone receiving a notice of violation should act promptly to obtain qualified legal counsel, because private enforcers can sue in court after giving 60 days’ notice. Certain defense strategies can be utilized to try to force an out-of-court settlement for a non-cooperating private enforcer, or at least make a court judgment less appealing to the claimant. Businesses should also take steps to minimize civil penalties and thereby ASPs by taking immediate corrective action as well as ensure that their legal counsel put together a defense that supports a minimal civil penalty recovery under the law. Conkle, Kremer & Engel attorneys are experienced at helping clients defend against Proposition 65 claims, resolving them cost-effectively and efficiently, as well as implementing proactive strategies to avoid Proposition 65 and other regulatory issues. 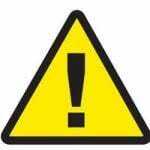 The “warning symbol” : A graphic “warning symbol” is now required on consumer products, other than food products. The “warning symbol” must be printed in a size no smaller than the height of the bolded word “WARNING,” and should be in black and yellow, but can be in black and white if the sign, label, or shelf tag for the product is not printed using the color yellow. The entire warning must be in a type size no smaller than the largest type size used for other “consumer information” on the product, and in no case should be smaller than 6-point type. Listing of a specific chemical: Warnings must now specifically identify at least one listed ingredient chemical for each toxicological endpoint (cancer and reproductive toxicology) and include a link to OEHHA’s new website P65Warnings.ca.gov. Certain special categories of products, such as food and alcoholic beverages, have a specialized URL that must be used instead. Internet and catalog requirements: For internet sales, warnings must be provided with a clearly marked hyperlink on the product display page, or otherwise prominently displayed to the purchaser before completion of the transaction. It will not be sufficient if the product sold on the internet bears the required label, but the internet point of purchase listing does not. For catalog sales, a warning must be provided in a manner that clearly associates it with the item being purchased. Short-form warnings: The regulations allow the use of certain abbreviated “short-form” warnings, which may omit the identity of any specific chemical, only if the warning is printed on the immediate container, box or wrapper of the consumer product or is affixed to the product. For example, “ WARNING: Cancer – www.P65Warnings.ca.gov.” If a short-form warning is used on the product, the same short-form warning may be used for internet and catalog sales. The regulations seek to minimize the burden on retail sellers of consumer products, but there are some obligations affecting resellers. Manufacturers, producers, distributors, and other upstream businesses comply with warning requirements if they affix a clear and reasonable warning to the product, or provide written notice and warning materials to an authorized agent of a retailer, among other requirements. Retailers who receive products with a Proposition 65 warning on the label, or who receive proper notice that a warning is required, are responsible for placement and maintenance of internet warnings for those products before selling to consumers in California. Retailers should only be liable for Proposition 65 violations under limited circumstances, such as if they cover, obscure, or alter a product’s warning label, or if they receive notice and warning materials but fail to display a warning, including catalog and internet warnings preceding consumer sales into California. The particular requirements for each specific product can vary, so manufacturers and resellers are well-advised to seek qualified counsel to review their circumstances before committing to potentially costly label and website changes that may not comply with the new requirements. Conkle, Kremer & Engel attorneys stay up to date on important regulatory developments affecting their clients in the manufacturing and resale industries, and are ready to help clients navigate the changing regulatory landscape in California and elsewhere. On March 20, 2018 Conkle, Kremer & Engel attorneys Eric S. Engel and Aleen Tomassian helped the Personal Care Products Council fulfill part of its mission by organizing and executing an effective lobbying day to advance the legislative interests of the industry. Led by PCPC Senior Vice President Government Affairs Mike Thompson and PCPC Director of Government Affairs Karin Ross, a group of personal care product industry members, lobbyists and advisors heard presentations by pivotal regulatory agencies and then met with key legislators and their staffs to address issues of importance to the industry. The PCPC held a luncheon at which it presented its first Legislator of the Year Awards to congresspersons who have been the most effective in advancing the important interests of both business and consumers in relation to personal care products. Legislative staff also received an educational presentation from PCPC’s new Chief Scientist, Alex Kowcz, to help bring to Legislators the most current scientific information about issues affecting personal care products. After a long day of meetings, participants unwound and connected at an informal reception for legislators, the governor’s office and administration officials at Ella, a popular restaurant near the State Capitol. Some of the highlights of the 2018 PCPC California Lobby Day included a presentation by Meredith Williams, Deputy Director of Department of Toxic Substances Control (DTSC), and Rick Brausch, Chief of DTSC’s Policy and Program Support Division, Hazardous Waste Management. The mission of the DTSC is the Safer Consumer Products (SCP) program, directed toward advancing the design, development and use of products that are chemically safer for people and the environment. The aim is to reduce toxic chemicals in consumer products and create new business opportunities in green chemistry. Dr. Williams advised the PCPC group that DTSC’s SCP program intends to focus over the next three years on nail salon products, particularly to assure a safe working environment for salon employees as well as customers, such as by assuring adequate ventilation and safety equipment. Dr. Williams also noted that Volatile Organic Compounds (VOCs) are not only within the ambit of California’s Air Resources Board (ARB) as to their effect on the environment, but they are also within the scope of DTSC’s authority when regulation of VOCs can meaningfully enhance protection of human health. On February 8, 2018, DTSC released a draft 2018-2020 Priority Product Work Plan for public review, in which “Beauty, Personal Care and Hygiene Products” are identified as targets for possible regulation. Of some concern to PCPC, the Priority Product Work Plan includes DTSC’s interest in broad classifications of chemicals without defining exactly which chemicals in what formulations are of concern. For example, DTSC’s Priority Product Work Plan identifies oxybenzone, BPA, DEA, formaldehyde, phthalates, parabens, triclosan, titanium dioxide, tolulene and VOCs as classes chemicals being considered for possible regulation, but there are a great many specific chemicals, formulations and uses within such classes, and not all of them are likely to be of concern to DTSC. PCPC expressed its concern that broad classifications can cause confusion among manufacturers and consumers, and unnecessarily inhibit product development and sales. For example, oxybenzone (aka Benophenone-3) is one of just 16 chemicals approved by the US Food and Drug Administration (FDA) as safe and effective for use as an ultraviolet (UV) filter to achieve broad-spectrum sun protection. The health benefits of effective UV sunscreens are well documented, but the broad suggestion of “endocrine toxicity” or “dermatoxicity” in DTSC’s identification of oxybenzone is on shaky scientific footing. Dr. Williams noted that the 2018-2020 Priority Product Work Plan is only in draft form, and that DTSC recognizes the broad nature of the chemical groups identified and is working on identifying specific chemicals of concern rather than entire classes of chemicals. DTSC’s Richard Brausch spoke of the hazardous waste logistics issues facing the personal care product industry, affecting the entire supply chain from manufacturers to retailers. The issue often occurs when products are returned from retailers, and questions arise as to whether they may be regarded as hazardous waste if they are no longer considered fit for regular sale, such as when new product labeling is introduced. Issues can arise as to who has responsibility for proper transportation and disposal of the products, whether by sale in secondary markets, repair or refurbishment, donation to charities or recycling. It is notable here that improper transportation and disposal has led some local authorities to sue retailers and wholesalers for failing to use hazardous waste transporters. That in turn has caused retailers to impose anticipatory disposal charges on manufacturers and wholesalers for a wide range of products. PCPC therefore supports Assembly Member Bill Quirk’s introduction of new legislation, AB 2660, which places the onus on the disposal company to determine the correct method of transportation, as that is not within the expertise expected of retailers. The overriding hazardous waste concern is that California uses an “aquatic toxicity” (aka “fish kill”) test that is grossly out of alignment with federal law, and which results in most cosmetic products being characterized as hazardous under California law. The “fish kill” test is exactly like it sounds – it tests only whether quantities of the subject product added to a water tank will kill fathead minnows. The test is not regarded as especially accurate, notably because high viscosity products that are otherwise harmless can kill the fish by clogging their gills. Further, the test presents a significant problem for the personal care products industry, which has taken a strong stand against animal testing, so manufacturers generally do not conduct this “fish kill” test on finished products. PCPC therefore advocates a more modern approach to accomplish the same goal, by use of a more recently developed fish embryo test (FET), in which live fish are not killed. An interesting side note is that SB 1249 was introduced by Senator Cathleen Galgiani to prohibit importation or retail sale of any cosmetic that was developed or manufactured using animal testing after January 1, 2020. While PCPC takes a strong stand against animal testing, it could not support the bill as written because it included no exception for products marketed in countries (notably China) which require that products be subject to animal testing. Rather, the PCPC has been working to obtain an amendment of the proposed legislation to make it conform to that of the European Union, which has strong anti-animal testing regulations but allows for accommodations to make products acceptable for sale in China. Dr. Michael Benjamin, Air Resources Board Chief of Air Quality Planning and Science spoke about the substantial product data that ARB had collected from product manufacturers selling in California, through extensive annual surveys conducted over the past three years. From that data, ARB is working to identify trends in emissions of VOCs. Of particular interest is a February 15, 2018 publication in the academic journal Science of a study of VOC emissions from consumer products. The Science publication (Volatile Chemical Products Emerging as Largest Petrochemical Source of Urban Organic Emissions, by Brian C. McDonald, Joost A. de Gouw, Jessica B. Gilman and others), Science Vol. 35, Issue 6377, pp. 760-764 (Feb. 16, 2018)) caught popular attention and some popular press because it found that vehicle emissions had become so much cleaner over the past decades that they were now responsible for less than half of VOC emissions. Overall, the total volume of VOCs had diminished greatly. Further, while the Science article authors made many assumptions on which they based their assessment of VOC contributions of consumer products, Mr. Benjamin pointed out that ARB has the actual data from its industry surveys to determine whether the author’s assumptions and conclusions are well founded. ARB therefore intends to do its own assessment of the points made in the Science article to determine what further action is appropriate. See the Beauty Industry Report article on the PCPC California Lobby Day here.